Lucy Derrick is a young woman of good breeding and poor finances. After the death of her beloved father, she is forced to maintain a shabby dignity as the unwanted boarder of her tyrannical uncle, fending off marriage to a local mill owner. But just as she is on the cusp of accepting a life of misery, events take a stunning turn when a handsome stranger — the poet and notorious rake Lord Byron — arrives at her house, stricken by what seems to be a curse, and with a cryptic message for Lucy. Suddenly her unfortunate circumstances are transformed in ways at once astonishing and seemingly impossible. With the world undergoing an industrial transformation, and with England on the cusp of revolution, Lucy is drawn into a dangerous conspiracy in which her life, and her country’s future, are in the balance. Inexplicably finding herself at the center of cataclysmic events, Lucy is awakened to a world once unknown to her: where magic and mortals collide, and the forces of ancient nature and modern progress are at war for the soul of England . . . and the world. The key to victory may be connected to a cryptic volume whose powers of enchantment are unbounded. Now, challenged by ruthless enemies with ancient powers at their command, Lucy must harness newfound mystical skills to prevent catastrophe and preserve humanity’s future. And enthralled by two exceptional men with designs on her heart, she must master her own desires to claim the destiny she deserves. 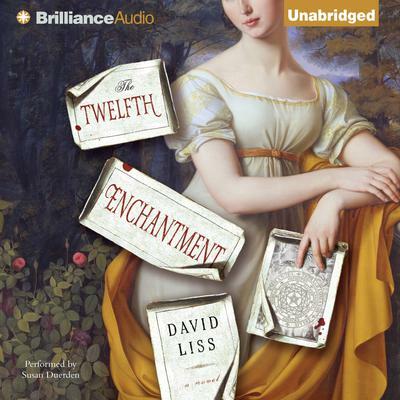 The Twelfth Enchantment is the most captivating work to date of a master literary conjurer.